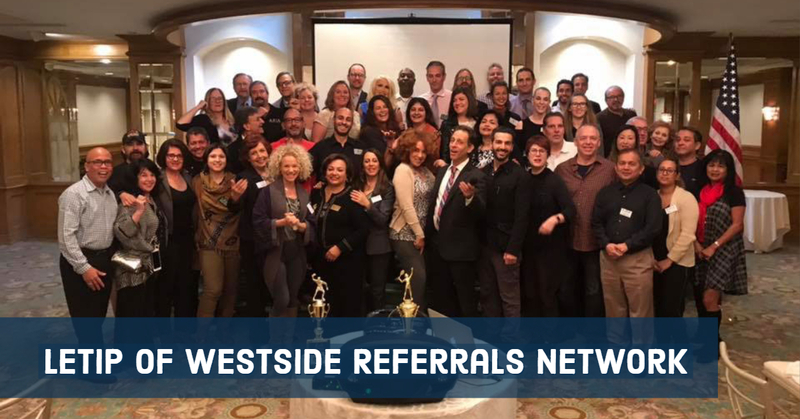 LeTip International, Inc. LeTip of WRN, CA - LeTip International, Inc.
LeTip of Westside Referrals Network, CA holds the title of the third largest chapter in LeTip and overall largest on the West Coast. This Los Angeles chapter celebrated their 20th anniversary in 2018. Breaking last year’s record, this year they passed $3 million worth of tips, or as they like to call them “thank you notes”. With their 66 members, each seat value averages to an estimated $45,500. LeTip of WRN’s top three tippers averaged more than 175 tips each throughout the year. Their top tipper this year was Greg Davis, 8-year member who holds the Contractor Landscape category, with more than 200 tips! Steve Mass a 17-year member, membership chair, and purple badge holder (100 members sponsored), says “Ever since joining WRN I have had nothing but success. Majority of my business comes from this group and I would never leave. The relationships I have made turned into life-long friendships. Leaving this group would be business suicide”. “I love the family-like atmosphere,” says President, Marc Golub. It is a goal to have weekly one on ones and small group interactions. In December, they held a “Holiday Bazaar” which was a success. About 40 guests visited this networking event which was full of raffles and interactive networking. The chapter also held a flag football tournament!